Stephen Hales was clergyman who made his first scientific discoveries after age 50 and proceeded to become a leading English scientist of his era. He considered his most important work to be the design of a ventilation system for use on ships and in prisons and made seminal discoveries in plant physiology. During the course of studying the flow of sap in a vine, it was necessary for Hales to stem this flow to prevent plant damage. He tied a piece of bladder over the cut and, unexpectedly, noted that the force of flowing sap caused bladder expansion; Hales applied the same approach to measuring blood pressure and built upon the observations of William Harvey. During pioneering studies on the heart in the early decades of the seventeenth century, Harvey reported that blood pulsated as it flowed from a severed artery, as if influenced by rhythmic pressure. FROM PLANT TO HORSE. Hales’s first experimental subjects were horses. He tied a live horse lying on its back to a barn door, and placed a brass tube into its femoral artery, with the flexible windpipe of a goose used to connect the pipe to a nine-foot-long glass tube. When he untied the ligature around the artery, the blood rose to a height of over eight feet. He then studied variables that maintained and influenced blood pressure, such as the volume of blood pumped from the heart (cardiac output) and the capacity of blood to flow through the smallest blood vessels (peripheral resistance). Hales estimated cardiac output by determining the product of the heart rate and the volume of the heart, which he determined using a wax mold. Variations in peripheral resistance were evaluated by injecting various substances—as brandy and saline solutions—into an isolated heart and measuring the rate of the output; these differences were attributed to the diameter of the capillaries. He described these results in his 1733 work Haemastaticks. Plants were Hales’s primary interest, and he applied what he observed in animals to his study of plants. More significantly, he observed analogies between the plant and animal worlds, as the role of sap in plants and blood in animals. SEE ALSO: Harvey’s De motu cordis (1628). 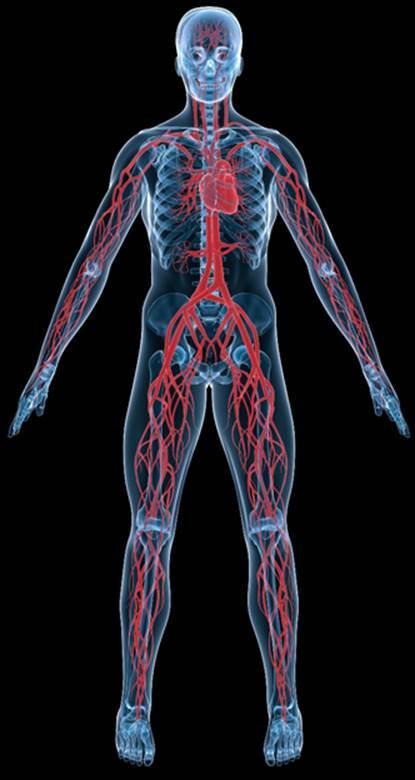 Human cardiovascular system, depicting the heart, arteries, and veins.